Native to North America and popular as a pet, the box turtle's most notable feature is its shell, the bottom half of which has a hinge that allows it to close completely to protect the animal's head and limbs. With the right diet and environment, a pet box turtle can live 40 years or longer. Box turtles are brown and have either a yellow or orange pattern on their shells. They grow to be around five inches long, and males are usually a little bit bigger than females. You can tell if a box turtle is male or female by looking at the eyes. Males have bright red eyes; females have brown or gray eyes. A box turtle's upper shell, or carapace, is highly domed, which gives it room to pull its head and limbs inside when it feels threatened. The box turtle's natural range covers most of the eastern half of the United States, from the southern part of Maine to the tip of Florida. They can be found in open, grassy areas as far west as Texas, Kansas and Oklahoma. Though they live mostly on land, box turtles usually make their homes near ponds and streams where they can go for a dip when temperatures get too hot. They also stay cool by using their claws to dig burrows. Box turtles are active during the day, mostly at dawn and at dusk, and sleep at night in shallow pits. During the winter, box turtles in the north hibernate, or go into a state of deep sleep. Box turtles are omnivorous, which means their diet includes both animals and plants. 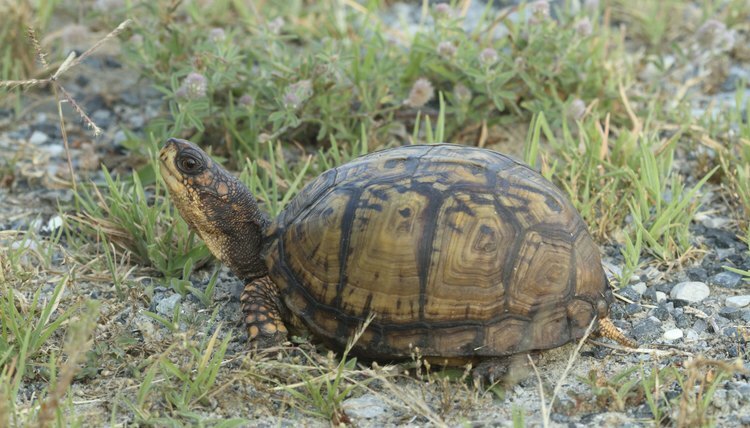 In the wild, box turtles eat almost any creature they can catch, including worms, snails, birds, fish and frogs. They also munch on berries, flowers and plant roots. If you want a box turtle as a pet, you will need at least a 20-gallon aquarium to keep it in, according to the American Animal Hospital Association. Cover the bottom of the aquarium with a layer of a material that can hold moisture, such as a mixture of sand and soil. This material, called a substrate, should be replaced once a week. Box turtles also need a hiding place. You will need to make sure your box turtle has fresh water at all times. Pick a water bowl that your turtle can fit into comfortably, but that is shallow enough to keep it from drowning. Box turtles use their water bowl as a toilet; therefore, you must replace the water several times a week. In order to keep your box turtle healthy, the AAHA recommends that half its diet should be made up of critters like worms, crickets or snails. The other half should consist mostly of dark, leafy greens and other vegetables, like sweet potato, carrots or squash. Box turtles also like fruit, including apples, cherries, strawberries, oranges, figs and bananas. Fruit doesn't provide minerals, however, and should make up only a small portion of your box turtle's diet.